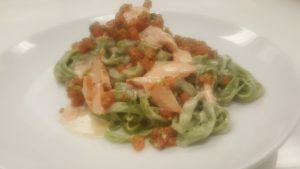 Spinach tagliatelle with hot smoked salmon, tomatoes, and lemon cream is a quick and delicious meal. The contrast of the green pasta with the red tomato creates a pleasant looking dish. 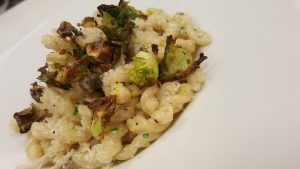 We are pleased to offer this recipe from Chef Tony. If you are not a fan of smoked salmon, you may eliminate it or use fresh grilled salmon or shrimp as a substitute. 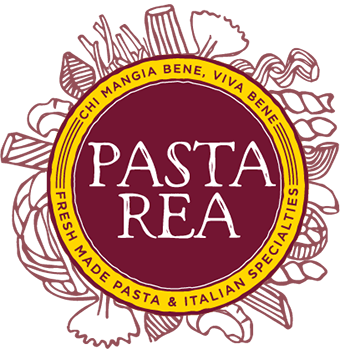 Enjoy this delicious meatless pasta recipe utilizing fresh Pasta Rea gemelli. (derived from the Italian word for “twins”) Other small pasta shapes such as cavatappi may be substituted for gemelli. Be sure to not over-cook the fresh pasta! Pre heat oven to 325 degrees. Remove the outer thick leaves of the Brussels sprout and discard. Remove the next layer of leaves until the hard center of the Brussels sprout remains, reserve core. In a small bowl toss the tender outer leaves with ½ tsp EVOO a pinch of sea salt and a pinch of pepper, reserve the remaining salt and pepper for later use. Place seasoned leaves on an oiled pan and place in oven. Roast until golden brown, about 5 – 7 minutes. Remove from oven and hold to the side. With a sharp knife thinly shave the cores of the Brussels sprouts, hold to the side. In a large sauté pan heat the remainder of the EVOO, add the cleaned mushrooms, garlic and shaved Brussels sprouts. Sauté until tender. Deglaze with white wine and simmer to reduce by half. Add PASTA REA Alfredo, butter and lemon juice, simmer on low. Cook pasta in boiling, salted water until al dente, drain well. Add pasta to sauté pan with sauce, ½ of Romano cheese and chive. Toss well.